I keep forgetting to post this, but I finally remembered! Last week my cousin and her friend were visiting and we were talking about board games. Her friend asked if I had heard of Carcassonne? After everyone had finished laughing, my family explained to her who I was and what we do here on this site, and the following evening we got a 4-player game together with my cousin, her friend, my brother, and me. My cousin had never played before, so we only played with the base game and river for the first game, and then added I&C and T&B for the second game. We used my 100-point scoreboard with 10-sided dice, which I was excited about even though the scores ended up being very low. Both games ended up being quite frustrating, as each player was drawing tiles that they had no use for but someone else needed desperately. My cousin didn't seem very into the game, stating that she "never wins anything", and the reason for that became obvious quite quickly: she doesn't try to win. I ended up helping her complete features a few times. During the second game there was quite a nasty situation brewing between my cousin and my brother. She had a nice city going, and my brother set himself up to get his large meeple into it. He wasn't able to draw a tile that allowed him to make the final connection, and I happened to draw the only tile in the bag that would allow the city to be completed (due to the surrounding tile geography) and leave him with a 2-tile city. Sorry, didn't take pictures. They already thought I was weird for having a 300-page rulebook. Some of our global moderators are not as active as they used to be, so we're looking to add a few active people to the moderation team. We have some ideas about who would be good candidates for this, but I think the most important thing is to find out who is interested and has time to take this on? We have a pretty good community here, so the additional workload is very minimal. The odd time we get a new member that posts something in the wrong place and it just needs to be moved. Please reply below if you're willing to help us out. What feelings did you have when you read the title of this thread? Did it bring back warm childhood memories, or did you cringe a little because by today's Euro-game standards the game of Monopoly seems archaic and outdated? When I was growing up, there were two kinds of board games. The kind that we had in our games closet, and the kind that other people had in their games closet. We didn't have Monopoly at my house. It was a game which held a certain mystique for me. I don't know what it was, but something about the game appealed to me. I learned how to play from other people, which of course meant that I learned how to play the wrong way. Landing on Free Parking meant winning a giant pile of cash, which turned me off from the game a bit because I never seemed to land there. I wasn't until decades later that I actually read the rules and discovered the truth about Free Parking. I always wanted my own copy of the game, but more than a decade went by until I found a copy at a second-hand shop and convinced my Mom to buy it for me. Buying games from second-hand shops was a bit of a gamble; sometimes there were pieces missing. Sure enough, this copy of Monopoly was missing one of the title deed cards and all of the tokens. This was LONG before you could easily obtain replacement components on eBay, or find an image on BGG and print your own. Some people had photoshop... I had a photocopier. I photocopied enough title deed cards to get all the letters to spell Pennsylvania Avenue, and I made a new title deed card on the photocopier. It was black and white and terrible, but it worked. Replacing the tokens was equally creative: instead of car, dog, and shoe - my Monopoly game had rubber washer, 3/16" hex nut, and wing nut. Whatever small pieces of junk I could find in the junk drawer became playing pieces. As my brothers lost interest in playing board games, Monopoly faded into a distant memory along with everything else. Over the past year, I've been thinking about my childhood again, and all the things I wanted but never got to have. I did my research to see what was out there, find the best prices, and started buying. Eventually I remembered Monopoly, and I read all sorts of pages on BGG to see what was out there. I learned about the Stock Exchange add-on. This was interesting to me because my cousins used to play Monopoly and Stock Ticker simultaneously. The penultimate Monopoly set seemed to be the Franklin Mint set, but according to the prices on eBay this was way out of my price range. Then I found an obscure reference on World of Monopoly to a cheaper set made by the Danbury Mint which was supposedly better. (It's better in some respects, but I also like certain things about the Franklin set.) I managed to find a copy on eBay at a price I was willing to pay, and it arrived last week. All the components are there, but no instructions. Back to the Internet, where several different versions of the rules are available. Which one to pick? What's this about a Speed Die? Hey look, the rules for Stock Exchange and all the files I need to print my own copy! You might be able to guess what I did last Saturday. I started writing a Complete Annotated Rules for Monopoly. I also started printing the Stock Exchange expansion files to upgrade my game, but I need to find some colored card stock to match the Community Chest and Chance cards. I also made a few eBay purchases to make this the best Monopoly set I can. Next year I plan to buy a copy of the Mega Edition. Gas Company here I come! Did you play Monopoly as a kid? What was your favorite token? We are proud to announce that Carcassonne will be featured on Geek & Sundry's TableTop on December 26th! Millions of tiles have been set, roads have been built, and cities have been stolen; yet each year hundreds of people still discover the wonderful game that is Carcassonne. One tile at a time, Carcassonne has become a classic among board games and continues to bring families and friends together worldwide. With dozens of expansions, related products and goodies, Carcassonne has proved that its following is large and loyal. Once you set your first tile you are hooked, there is no going back. The fact that TableTop has decided to feature the game in one of their episodes shows how it is one of the best of the best that the board game world has to offer. Rumors say that host Wil Wheaton is unbeatable at Carcassonne... will that be the case? Or will someone come and claim victory at the last second? You will have to watch on December 26th to find out! To celebrate Carcassonne on TableTop, we have tons of BIG surprises ready for you as of next Monday. Stay tuned to see how we help you celebrate Carcassonne on TableTop December 26th! The Marketplace / Purple phantoms? There's a few sellers that have translucent meeples available in the five standard colors, but has anybody seen a source for individual purple translucent meeples? I'm interested in getting a full set of eight to stick in my 10th Anniversary box. Not sure if this is really newsworthy, but I know that Kettlefish thinks it's a big deal so maybe it is. Gantry and I live about 30 minutes from each other, but we'd never actually met. We're just two out of 2.5 million people who live in this part of the world. When Kettlefish decided to send him one of the surprise packages, she insisted that I had to deliver it to Gantry in person. Gantry does a lot of travelling, both for work and for fun, so it took a few weeks to find a time that would work for him. We met at a little Mexican restaurant a few blocks over from where I work, which I found interesting because I had no idea it was there and because there aren't a lot of Mexican restaurants around here. We talked for about an hour on a variety of subjects. I brought him up to speed with regards to what's been happening with the Complete Annotated Rules, the Carcassonne Shoppe, and the work Kettlefish has been doing around the Carcassonne community (which Gantry thinks is fantastic by the way). Like myself, Gantry hasn't had an opportunity to play Carcassonne for a long time, so he feels lost when somebody is asking a rules question regarding an expansion he doesn't know anything about. Gantry told me more about the history of Carcassonne Central. He was a regular user of BoardGameGeek, but found the forums difficult to use. (I think many of us can understand that feeling.) He tried to reach out to the guys who ran the site, but never heard anything back. Eventually, his frustration with the BGG forums led to his decision to create Carcassonne Central. He found a fan site about the game by Matt Harper, an Englishman living in Germany, and sent him an e-mail. (Matt's web site is still available here: http://carc.mjharper.de/) They collaborated on building a community around the game; Gantry was the technical "make it happen" guy, and Matt was the rules answer guy. Matt created the Complete Annotated Rules and posted it on BoardGameGeek, with a note that updates would only be available at Carcassonne Central, and only to members. Thousands of Carcassonne fans signed up just for the privilege of getting their hands on the latest version of the Complete Annotated Rules. Most never made a single post, but a core group of people arose. Some of those people moved on, and others took their place. Somewhere along the line, we started churning out fan-made expansions on a weekly basis. I feel like this coincided with a time where official expansions weren't being published by Rio Grande, and the community wanted more. Something that we talked about was our ideas for the future of Carcassonne Central. Gantry shared some ideas with me that had been rattling around in his head. He had a few specific ideas, some of which I found appealing but I'm not sure if they're all possible. My ideas are more general: I'd like to see us back in our former glory, churning out expansions and variants on a regular basis (not necessarily weekly, but monthly would be good). We also talked a bit about what we do for work, and interesting things we've done in the past. I used to be in a similar line of work, so it was fun for me to hear about things Gantry had been involved with, and for me to tell him about things I'd done. Some stories are only interesting to people in the same industry as you. I suspect a few people will be disappointed that we didn't play a game of Carcassonne, but that might happen in the future. We both agreed that our meeting should have happened a long time ago, and we're both interested to meet some of the other people on here as well if we're ever in your area. As part of their recent web site relaunch, Z-Man Games now sells Carcassonne and expansions directly from their warehouse. This year’s theme is “Superheroes,” and we are looking forward to an extra “SUPER” show. We once again want to thank Mayfair Games, our show Co-Sponsor, for the third year! In addition, many of the great events that happen at Origins are a direct result of our wonderful exhibitors. Please be sure to let them know how much we appreciate them. I also want to announce our Special Guests Ioan Gruffudd and Kevin Sorbo and our Guests of Honor: Artist Charles Urbach, Game Designer Steve Jackson, Author Patrick Rothfuss, Game Designer Steve Kenson, and Game Designer Steven S. Long. New this year: look for MORE company-sponsored play events in the main gaming hall. More than 10 of our largest sponsors are setting up play space just for you! Board Games: The Mayfair Room, Rio Grande Room, The Board Room, (Asmodee, WizKids, Ascension, and more). Role-Playing Games: D&D (Living Forgotten Realms, a Battle Interactive, and D&D Next! ), Pathfinder (The Pathfinder room and a Special & level +12th play), The Gathering, d20Pro, The Origins Indie Press Room, Fast Play, and more. Miniatures: WizKids HeroClix Nationals (they’re back! ), plus BattleTech Tournaments, Warlord Tournaments, and the new Command Post for war game skirmishes. CCGs: The Star City Open returns, along with Konami Extravaganza, for a second year! Also returning, the V:TES National Tournament. New this year, Cardfight!! Vanguard. LARPs: The Edhellen Dungeon — the entire first floor of the Hyatt & the Crowne Plaza space is FULL of LARP events this year. New! An Electronic Game Room … come play the electronic version of your favorite games. Returning this year are the Family Track, Kids Room, Theme Bar, Origins Costume Contest, Smithees, Origins Awards, Origins Auction, and so much MORE! Help us shape the future and join us for the 2013 Origins Game Fair: Where Gaming Begins! For more than 45 years, Gen Con Indy has set the trend in gaming and has broken attendance records. Last year, more than 134,775 turnstile and 41,000 unique attendees experienced Gen Con Indy. Featuring game industry veterans, award-winning authors and artists, jaw-dropping costumes, thousands of events, a growing Family Fun Pavilion, and the newest games on the market, Gen Con truly is The Best Four Days in Gaming™! Gen Con is more than just a convention, however. It's a passion, a community, and a unique experience that keeps people coming back for decades. The only way to truly understand Gen Con is to attend. Join us! The 2. Carcassonne fan meetings in the West take place at the castle "Burg Konradsheim" in Erftstadt . Of course, author Klaus-Jürgen Wrede again will be there too and he introduces his games. Many surprises await the visitor! Playing time: from 11 am to 5 pm. Today a "meet and greet" will take place from 6 pm to 10 pm with the author Klaus-Jürgen Wrede in the House of the patient. In addition to signing new Carcassonne variants can be tested. Admission is free! A friend of mine invited me over to play some games this afternoon. He mentioned that he had recently acquired a game where you build cities and roads. Sure enough, it was Carcassonne. He has a Rio Grande edition from one of the final production runs, so no river tiles but at least the rules are 3rd edition so I didn't have to teach him anything. I put down farmers on my first two turns, which surprised him. His experience has been that farms are not worth much. I think this is partly due to the lack of river expansion. He eventually put down a farmer as well, and joined his farm to mine. I managed to connect my two farms together and retake the majority, but towards the end of the game he managed to get another farmer down, making us tied. I quickly put down another farmer and managed to connect it with the final tile of the game. The farm ended up only being worth 18 points because we had only completed 6 cities. I had an unfinished cloister worth 7 points. I had only drawn 2 or 3 cloisters - he drew the rest and finished all except one which was never occupied because he didn't have a follower to place. I spent most of the game working on two long roads and two large cities, one of which wasn't completed. He did a lot of smaller cities and shorter roads. I forget the exact scores, but he was somewhere in the 100-150 range and I was in the 50-100 range. 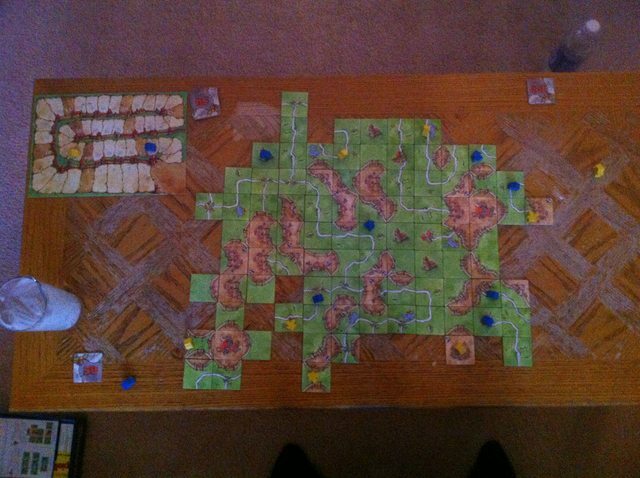 Although I find 3+ player games to be more enjoyable, it was very nice to play Carcassonne again after so many years. I like planning how I want the landscape to be, and managing to pick up the right tiles to make it happen even though I picked up a lot of tiles I didn't really want. The only real disappointment was when I created the perfect "hole" for a cloister, and when he drew the last one, he didn't see the hole was there and put it down somewhere else. I stumbled across this on Kickstarter this morning, and there's something about it that makes me feel like I need to share it with you guys. It has elements of both "old school" and newer games. The only downside for me is the price, but I see a lot of potential for fan-made expansions: James Bond, Austin Powers, Get Smart, NOLF, etc.